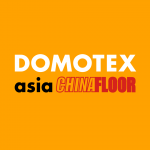 DOMOTEX asia/CHINAFLOOR is the leading flooring trade exhibition in Asian Pacific and the second largest flooring trade exhibition in the world. The 17th edition of the exhibition is being held March 22-24, 2016 in Shanghai New International Expo Centre, Pudon. Make sure to come & find us at at Booth E1D01 to learn more about our new flooring designs.